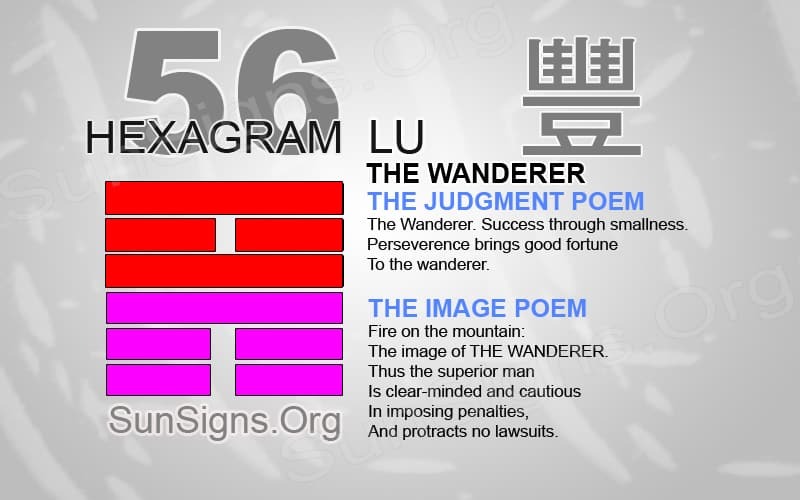 What Is I Ching Hexagram 56 All About? Hexagram 56 yijing represents a time to go on a journey. Often we feel the need to travel. But, now is the time to do so to gain knowledge and not just to escape. There is much knowledge, wisdom, and beauty to be discovered in the world. We leave behind our homes to discover something new. There are usually two reasons for wanting to travel. One is the need to escape our current living situation to start a new, or at least return refreshed. While the other is the thirst for knowledge. This comes from visiting a new place and learning all you can from the area. This hexagram speaks more towards the second reason for wanting to travel. Hexagram 65 shows the human need of wanting to travel. There is no way to understand a new place than visiting it. This can never replace what is already known by simply reading a book or researching on the location. It takes the initiative to travel to that place to truly understand all that it has to offer. This is going beyond a family vacation or a weekend getaway to renew the spirit and gain a sense of a new start. Satisfying our hunger for knowledge by leaping into an adventure is both risky and highly rewarding. You might be visiting a new location that has different traditions and customs. It’s important to be open-minded about what you are about to see and learn. It can sometimes be hard to witness a custom when it goes against our moral code. Do not wish to bestow a change in that person. Instead, be polite enough to excuse yourself from the event. Also, there is no harm from walking away. But, there can be great damage when we try to impose our ideas on others. It is very likely that they will not understand anyway and will only have a response full of anger. Before leaving on a great adventure, make a plan. This should not be only something that is necessary to take with you but also what you plan on learning. Try to gain connections in the area you will be visiting. Bring with you plenty of maps and resources in case of an emergency. I Ching 56 divination says that you are taking a big risk to travel to gain higher knowledge. But, that does not mean you jump into the fire without preparing yourself first. Have a solid plan that will help secure a positive outcome from the travels. And, this will help keep the body, mind, and spirit strong. Do not travel just to run away from your relationships. Take your partner along and enhance your partnership. Travel for business and career will bring good results. Then, your way of thinking will open up when you explore different cultures. Traveling is a necessary part of life. We travel to work, school, and the homes of friends and family. But there is knowledge that is readily available. For this, we need to take the time to venture out past our comfort boundaries. Thus, we cannot completely comprehend a different culture through literature. But, it takes traveling to a new area to gain knowledge. Then you know about different types of people and things which inhabit the world. Also, when planning a trip, pick a location that will bring about a new perspective. I Ching 56 says that this might aid you in other parts of your life. Wisdom is available to all those who take the chance to discover it.